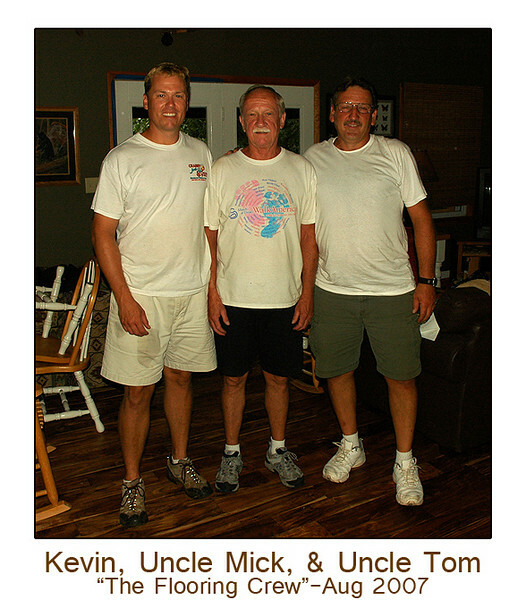 A special thanks to my cousin Kevin and uncles Mickey and Tom for assisting me with installing a wood floor in the cabin in early August 2007. These guys endured a 3-4 hr. drive without air conditioning during one the hottest days of the year to bust their butts helping me! Talk about love and family! Mickey traveled 5 hrs to help out and also helped me during a project in June 2006. Tom has done countless things for me at the cabin and always enjoys his visit to the woods. One day he'll visit and we will not work! Kevin spent a weekend away from his lovely family and ended up with a few blisters and bruised fingernails after working with the hammer. While we didn't complete the project 100% on this particular weekend, we knocked out 90% of it and the floors look great. Thanks again!